Ian Hamilton Finlay: Of Conceits and Collaborators. Ian Hamilton Finlay was born in 1925 in Nassau, the Bahamas, to Scottish parents. He returned to Scotland as a young child and lived in Glasgow, until the advent of the Second World War led to his exile in Orkney. He read many books on cubism and surrealism, and was greatly influenced by both art forms. He briefly attended Glasgow School of Art but was called up to serve in the War in 1942, at the age of seventeen, and was shipped off to Germany. There he had the opportunity to form friendships with the artists Colquhoun, MacBryde and Minton, and often stayed with them during his army years. On returning from Germany, Finlay worked as a shepherd in Orkney for a time, and simultaneously wrote copious short stories and plays, many of which were published in the Glasgow Herald. Eventually these were compiled together in book form. But it was his move to writing poetry in the 1950s that revealed Finlay’s true talent, although this was not initially appreciated in Scotland and his first collection, The Dancers Inherit the Party, did not sell well. In 1963 Finlay produced Rapel, his first volume of ‘concrete poems’, in which the structure of the poem on the page was as important to the piece as the words themselves. Finlay, like other concrete poets, believed the layout contributed greatly to the poem’s meaning. It is perhaps for his concrete poems that Finlay is best known, and they are among his greatest achievements. In the Sixties, Finlay also began to design gardens, laying out classical porticoes and Grecian temples using predominately traditional Scottish building materials – he also combined his poetry with his gardenscaping and sculpture, arranging words on wood and stone, and incorporating his poems into the gardens themselves. He has created gardens across the world, but the greatest is still his own garden, Little Sparta, at Dunsyre, near Edinburgh. 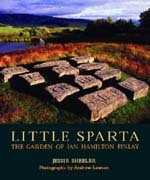 TLittle Sparta garden is 20 miles south west of Edinburgh – follow the A702 to Dolphinton, head west to Dunsyre, and 1 mile west of Dunsyre turn onto the track for Little Sparta. The garden is open to the public from June to September, Friday to Sunday 2pm to 5pm. Admission is by donation.